Betrayal. Despair. Murder. Blackmail. Romance. Tragedy. In the 1820s, a young woman embarks on a journey for a better life in America. She brings with her a three year old son, and plans to live with relatives she has never met in Philadelphia. Her loving husband remains in Ireland, taking in boarders and working the farm to save money for his departure. Goin' Postal tells the story of a real U.S. postal worker dealing with crazy situations that the public never sees. 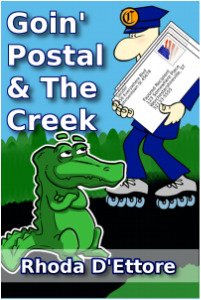 From human heads in the mail to alligators on the loose in the building, this book is sure to make you laugh. The second book in this combo, The Creek, tells stories set in the same location, but each story is set in a different time period. The last story depicts how the people and stories of the past are still alive today. Germany, 1934 -- SS officers entered the house of Hedwig Schultz and ripped her 14 year old brother, Edmund, from her arms. He has been selected for an elite division of the Hitler Youth that will train him for indoctrination into the feared SS. Horrified, Hedwig enlists the help of her brother in America to thwart Nazi plans regarding the Final Solution of the Jewish people. It becomes a cat and mouse game as the family enters a world of Nazi spies, double agents and the Underground movement. All the while, Hedwig must prevent their brother, Edmund, from becoming suspicious. One report of treason to his Hitler Youth instructors would result in death... or worse. Murder in the Family BOXSET includes three books: Newborn Nazi, Tower of Tears (The McClusky Series Book 1) and The Creek. Newborn Nazi is a story of sacrifice and determination in a world that becomes more frightening every day. When 14 year old Edmund is forced into the Hitler Youth, his siblings find themselves thrust into a world of espionage as they do everything in their power to save lives--including their own. Tower of Tears is the first in a series that follows a family of Irish immigrants to America in 1820. Jane came to Philadelphia for a better life, instead she found hell on earth. This story includes betrayal, murder, mystery, blackmail and a touch of romance. The Creek begins in 1777 and follows various families as they endure war, love, tragedy and sorrow. Subjects touched upon include WWI, Prohibition, Women's Suffrage, Vietnam and other periods of history over a 200 year period. The final episode is told from the 1991 point of view and depicts how the past comes alive.